Rather than spend his days gathering nuts in an honest way, this lazy squirrel found a shortcut. 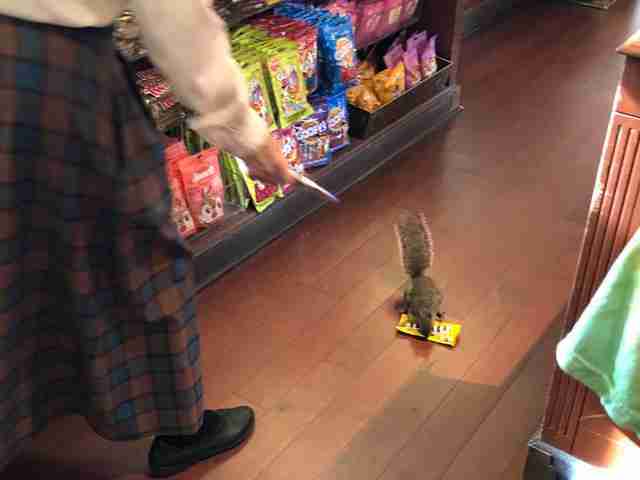 The fluffy-tailed rodent was caught on camera committing a brazen daylight robbery in a gift shop at Disney's Magic Kingdom in Florida. He was clearly undeterred by the presence of paying customers as he made a beeline straight to the candy rack — procuring himself a bag of peanut M&M's. In video of the incident, a woman can be seen trying to shoo away the thieving squirrel, but to no avail. He was obviously dead set on pilfering that chocolate-covered prize, and the people watching were powerless to stop him. “Oh my goodness!” one customer is heard saying, witnessing the little theft unfold. And then just like that, the squirrel made his getaway. It's probably fair to say that the Disney theme park was now the most magical crime scene on Earth, though the squirrel's robbing ways have hardly been met with derision. Brianna Bradshaw, who uploaded the video to Facebook, described him as a "cute little shoplifter." Where the squirrel ended up next is anyone's guess — though seeing how this heist went off without a hitch, it seems likelier than not that he'll be back for more.